in recognition of completing 30 hours or more of rigorous user experience training and passing the related exams. This status demonstrates a high level of dedication to UX education, and a strong commitment to the field of UX. The topics studied provide a solid foundation that rounds out personal, practical experience. 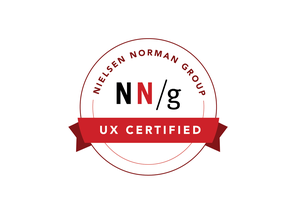 This UX Certification (UXC# 1003913) was achieved on 25 June 2015 and updated on 18 December 2018 with additional training.